School of Chemical Sciences, North Maharashtra University, Jalgaon - 425001, Maharashtra, India. 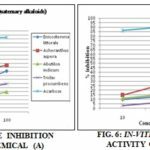 ABSTRACT: In the present study we screened four medicinal plants for the α-amylase inhibitory activity of each extracts phytochemicals, and it was determined based on the colorimetric assay using acarbose as a reference compound. The aqueous and ethanol extracts of the medicinal plants viz. 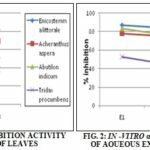 Enicostemma littorale, Achyranthes aspera, Abutilon indicium, and Tridax procumbens were shown moderate α-amylase inhibitory activity against a reference, an account of that Achyranthes aspera shows potent activity towards remaining. Not only leaves but also the whole plant is used for comparative in-vitro study of inhibition of α- amylase activity. INTRODUCTION: Metabolic disorder is one of the common ailments in a living organism. In human being numbers of diseases are well known which associated with metabolism. Diabetes mellitus is the most common disease of metabolic malfunction depicted by chronic hyperglycemia or increased blood glucose levels. The malfunctioning associated with disturbances in carbohydrate, fat and protein metabolism resulting lack of insulin secretion 1. It has been observed that both genetic and environmental factors are responsible for disease 2. The much subclinical complication may occur due to long tern persistence of metabolic disorder including arteriosclerosis. In some cases diabetes mellitus may remain asymptomatic till ketoacidosis or coma, depending up on the severity of metabolic malfunction 3. The diabetes mellitus may be classified into major as Type 1, diabetes mellitus and Type 2, diabetes mellitus. The classification is based on clinical observations. Type 1 is characterized by the destruction of the pancreatic beta cell whereas type 2 is due to decreased insulin sensitivity (insulin resistance) 4. Alpha-amylase is distributed all over various organisms and shows diverse substrate specificities, while possessing a common topology formed from three domain, one of which being a typical alpha-beta barrel. Inhibition of the insect’s alpha-amylase is a proposed method of crop protection. On the other hand, inhibition of mammalian alpha-amylase is a proven therapeutic approach in diabetes and related disorders 5. Widespread species of plants have been described in the scientific and popular literature as having hypoglycemic activity. Because of their perceived effectiveness, minimal side effects in clinical experience and relatively low costs, herbal drugs are prescribed widely even when their biologically active compounds are unknown 6, 7, 8. Acarbose currently marketed as a medicine in the treatment of diabetes, lowering postprandial peaks of glucose. However, acarbose is principally known as an alpha-glucosidase inhibitor, and cause side effects such as, abdominal distension, flatulence, meteorism, and possibly diarrhea. Therefore it is attractive to find a substance that has strong inhibitory activity against α-glucosidase. But the minor effect on α-amylase activity. A problem that seems not to occur in the case of alpha-amylase inhibitors 5, 9. Collection of Plants: Enicostemma littorale, Achyranthes aspera, Abutilon indicum, and Tridax procumbens was collected from Satpuda Mountain in the Maharashtra state of India and used freshly for extraction and isolation of their phytochemicals after grinding and both extracts stored in the refrigerator and used when needed 10, 11. Ethanol Extract: The crushed plant material was placed in a thimble of soxhlet apparatus 7, 12, 13 100g and 50g for the whole plant and leaves respectively and extraction carried out by using ethanol as solvent (for 12-14 h). The extracts were filtered; ethanol was distilled off using a rotary evaporator to furnish the desired brownish-green residue, the yield of which was 3.9% and 2.63% for the whole plant and leaves respectively. The residues were dissolved in ethanol at 100, 200, and 500 µg/mL concentration 14. Aqueous Extract: The 25g of crushed whole plant material was soaked in 25 ml, 50 ml, and 100 ml each in distilled water for 24 h. The extract was filtered by using a muslin cloth. The final volume was corrected to viz. 25 ml, 50 ml, and 100 ml by washing residue with distilled water (13-14) and used for the α-amylase inhibitory activity. The same procedure adopted for leaves. Isolation of Phytochemicals: Whole fresh plant of 35g E. littoral was ground in a mixture and homogenized by methanol: water mixture 4:1 (10 X Wt.) for 5 min. Then it was filtered, and the filtrate was evaporated. 2M H2SO4 was added and extracted with chloroform yielded terpenoids. Aqueous acid layer was made alkaline with NH4OH and then extracted with chloroform-methanol (3:1, 60 ml) twice, this extract afforded most of the alkaloids whereas remaining basic aqueous layer was evaporated and extracted with methanol yielded quaternary alkaloids. During purification of quaternary alkaloids, tannins were separated and analyzed 16. Similarly, phytochemicals of remaining all three plants isolated. Tannins (A): (200 mg compound in 10 ml distilled water, filtered); 2 ml filtrate + 2 ml FeCl3 blue-black precipitate indicate the presence of tannins. Terpenoids (B): 200mg Compound + 2 ml acetic anhydride + conc. H2SO4 red coloration of solution indicates the presence of terpenoids. Alkaloids (C) and quaternary alkaloids (D): (200 mg compound in 10 ml methanol, filtered); a 2 ml filtrate + 1% HCl + steam, 1 ml filtrate + 6 drops of Wagner reagent / Dragendroff reagent, brownish precipitate / orange precipitate indicate the presence of respective alkaloids 17, 18.
α-amylase Inhibitory Activity: The α-amylase inhibitory activity of each extract and phyto-chemicals was determined based on the colorimetric assay using acarbose as a reference compound (1-2). The starch solution (0.5% w/v) was obtained by boiling and stirring 0.25g of potato starch in 50 ml of deionized water for 15 min. The enzyme solution (0.5 unit/mL) was prepared by mixing 0.001g of α-amylase in 100 ml of 20 M sodium phosphate buffer (pH 6.9) containing 6.7mM sodium chloride. Both extracts and isolated phytochemicals were dissolved in a respective solvent to give concentrations for aqueous extracts are 25 ml, 50 ml, and 100 ml, for ethanol extracts concentrations are 100 µg/mL, 200 µg/mL and 500 µg/mL. 10 µg/mL, 50 µg/mL and 100 µg/mL for isolated phytochemicals. The color reagent was a solution containing 96 mM 3, 5-dinitrosalicylic acid (20 mL), and 5.31 M sodium potassium tartrate in 2 M sodium hydroxide (8 ml) and deionized water (12 mL). 1 ml of each plant extract and 1 ml enzyme solution were mixed in a tube and incubated at 25°C for 30 min. To 1 ml of this mixture was added 1 ml of starch solution and the tube incubated at 25°C for 3 min. Then, 1 mlof the color reagent was added and the closed tube placed into an 85 °C water bath. RESULTS AND DISCUSSION: All four plants showed satisfactory α-amylase inhibitory activity. This study deals with α-amylase inhibition activity of aqueous, ethanol extracts of the whole plant and leaves as well as isolated phytochemicals of four plants. Both extracts and isolated phytochemicals found to have capacity better inhibition of α-amylase. In-vitro α-amylase inhibition activity of aqueous extracts of whole plant and leaves. E-1, E-2, and E-3 represent that 25 g crushed plant material in 25 ml, 50 ml and 100 ml distilled water respectively. Aqueous extracts of leaves and whole plant of four plants as shown in Table 1. Both extracts showed activity at the higher concentration tested. Leaves of Enicostemma littorale exhibited grater activity i.e. it inhibits α-amylase activity by about 88.48%, 84.96%, and 81.67% at 25 ml, 50 ml and 100 ml concentrations respectively, followed by plant Achyranthes aspera and Abutilon indicum. Natural health products clearly indicated as a promising avenue for the prevention of chronic diseases. Similarly, in aqueous extracts of the whole plant, four plant extracts showed activity at the higher concentration tested. In whole plant extracts the maximum inhibition (%) of Enicostemma littorale was 86.83%, 83.74%, and 80.25% at 25 ml, 50 ml and 100 ml concentrations respectively, followed by plant Abutilon indicum and Achyranthes aspera so, in conclusion, both leaves and whole plant (aqueous) extracts Enicostemma littorale demonstrated grater activity but plant Tridax procumbens disappointing activity. Ethanol extract of leaves and whole plant of four plants are shown in Table 2. All four plants exhibited activity at higher concentration. 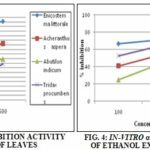 In ethanol leaves extracts of Enicostemma littorale showed greater activity i.e. it inhibits α-amylase activity by about 77.55%, 81.9 % and 85.59% at 100, 200 and 500 µg/mL concentrations respectively, followed by plant Achyranthes aspera and Abutilon indicum. Similarly in ethanol extracts of the whole plant, also plant Enicostemma littorale showed greater activity, i.e. 66.39%, 72.16% and 85.95% at 100, 200 and 500 µg/mL concentrations respectively, followed by plant Tridax procumbens and Acheranthus aspera. In the overall conclusion of both extracts aqueous and ethanol of leaves and whole plant, Enicostemma littorale showed greater inhibition of the α-amylase activity of all remaining three plants. Compound A of Achyranthes aspera inhibits the α-amylase having (%) 25.59, 48.55 and 57.62% at 10, 50 and 100 µg/mL concentrations respectively, followed by plant Enicostemma littorale and Tridax procumbens. In compound B the maximum inhibition (%) of Achyranthes aspera was 14.37, 28.41 and 43.04% at 10, 50 and 100 µg/mL concentrations respectively, followed by plant Abutilon indicum and Enicostemma littorale. Compound C the maximum inhibition (%) of Tridax procumbens was 39.63, 47.80 and 53.04% at 10, 50 and 100 µg/mL concentrations respectively, followed by plant Abutilon indicum and Enicostemma littorale. Compound D of Tridax procumbens inhibits α- amylase activity having 12.94, 19.12 and 31.16% at 10, 50 and 100 µg/mL concentrations respectively, followed by plant Abutilon indicum and Enicostemma littorale. CONCLUSION: In overall conclusion, plant Achyranthes aspera showed maximum inhibition in compound A and B. similarly plant Tridax procumbens demonstrated maximum inhibition in compound C and D.
World Health Organisation Consultation: Definition, diagnosis and classification of diabetes mellitus and its complications. Part 1: diagnosis and classification of diabetes mellitus. In Report of a WHO Consultation. Geneva 1999. 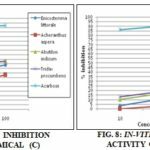 Nickavar B and Yousefiana N: inhibitory effects of six Allium species on α-Amylase enzyme activity. Iranian Journal of Pharmaceutical Research 2009; 8(1): 53-57. Nickavar B, Abolhasani L and Izadpanah H: α-Amylase inhibitory activities of six Salvia species. Iranian Journal of Pharmaceutical Research 2008; 7(4): 297-303. Christidus S, Savarimuthu I and Paul A: Antidiabetic effect of Symplocos cochinchinensis (Lour) S. Moore in type 2 diabetic rats. Journal of Ethnopharmacology 2011; 134: 298-304. Mahmoud N, Habibi AE, Hazareh N, Parichehreh Y, Parivar K and Larijani B: Trans Chalcone: a novel small molecule inhibitor of mammalian alpha-amylase. Journal of molecular Biology Rep 2010; 1-3. Daisy P, Jasmine R, Ignacimuthu S and Murugan E: A novel steroid from Elephantopus Scaber an ethnomedicinal plant with antidiabetic activity. Journal of Phytomedicine. 2009; 16: 252-257. Shirwaikar A, Rajendran K and Punitha ISR” Antidiabetic activity of alcoholic stem extract of Coscinium fenestratum in streptozotocin-nicotinamide induced type 2 diabetic rats. Journal of Ethnopharmacology 2005; 97: 369-374. Akerele O: Traditional Medicine: Nature's medicinal bounty; don't throw it away; world health forum 1993; 14: 390-395. Al-Zuhair S, Dowaidar A and Kamal H: Inhibitory effect of dates extracts on α-amylase and α-glucosidase enzymes relevant to non-insulin dependent diabetes mellitus; Journal of Biochemistry Technology 2010; 2(2): 158-160. Afonne OJ, Orisakwe OE, Obi E, Orish C and Akumka DD: Some pharmacological properties of Synclisia scabrida Indian Journal of Pharmacology 2000; 32: 239-241. Anyasor GN, Aina DA, Olushola M and Aniyikaye AF: The phytochemical constituent, proximate analysis, antioxidant, antibacterial and wound healing properties of leaf extracts of Chromolaena odoratk. Annals of Biological Research 2011; 2(2): 441-451. Vogel AI: Textbook of Practical Organic Chemistry, Edition 5th, 1994; 164. Karodi R, Jadhav M, Rub R and Bafna A: Evaluation of the wound healing activity of a Crude extract of Rubia cordifolia (Indian madder) in mice. International Journal of Applied Research in Natural Products 2009; 2(2): 12-18. Shimpi SR, Chaudhari LS, Bharambe SM, Kharche AT, Patil KP, Bendre RS and Mahulikar PP: Evaluation of antimicrobial activity of organic extract of leaves of Aristolochia bracteata. Pesticide Research Journal 2005; 17(1): 16-18. Chavan KM, Tare VS and Mahulikar PP: Studies on Stability and antibacterial activity of aqueous extracts of some Indian medicinal plants; Orient Journal of Chemistry 2003; 19(2): 387-392. Harborne JB: A Guide to Modern Techniques of Plant Analysis, London, UK. Published by Chapman and Hall, Edition 3rd, 1998: 6-7. Kumar GS, Jayaveera KN, Ashok Kumar CK, Umachigi PS, Vrushabendra Swamy BM and Kishore Kumar DV: Antimicrobial effects of Indian Medicinal Plants against acne including bacteria; Tropical Journal of Pharma-ceutical Research 2007; 6(2): 717-723. Faraz M, Mohammad K, Naysaneh G and Hamid RV: Phytochemical screening of some species of Iranian Plants; Iranian Journal of Pharmaceutical Research 2003; 77-82. Gupta OP and Phatak S: Pandemic trends in prevalence of diabetes mellitus and associated coronary heart disease in India - Their causes and prevention. Int J Diabetes Dev Countries 2003; 23: 37-50. Mahajan R and More D: Evaluation of anticoagulant activity aqueous and ethanolic extracts and their isolated phytochemicals of some medicinal plants. International Journal of Pharmacy and Pharmaceutical Sciences 2012; 4 (4), 498-500. Sudha P, Zinjarde SS, Bhargava SY and Kumar AR: Potent α-amylase inhibitory activity of Indian Ayurvedic medicinal plants. BMC Complementary and Alternative Medicine 2011; 11-5. Mohan V, Spiegelman D, Sudha V, Gayathri R, Hong B, Praseena K, Anjana RM, Wedick NM, Arumugam K, Malik V, Ramachandran S, Bai MR, Henry JK, Hu FB, Willett W and Krishnaswamy K: Effect of brown rice, white rice, and brown rice with legumes on blood glucose and insulin responses in overweight Asian Indians: A Randomized Controlled Trial. Diabetes Technology and Therapeutics 2014. Anjana RM, Pradeepa R, Deepa M, Datta M, Sudha V, Unnikrishnan R, Nath LM, Das AK, Madhu SV, Rao PV, Shukla DK, Kaur T, Ali MK and Mohan V: The Indian Council of Medical Research – India Diabetes (ICMR – India B) Study: Methodological details. Journal of Diabetes Science and Technology 2011; 5: 906-914. Mahajan RP, Mahire RR and More DH: Phytochemical screening of aqueous and ethanol extracts of some medicinal plants and in-vitro study of inhibition of α-amylase. Int J Pharmacognosy 2014; 1(8): 501-06. doi link: http://dx.doi.org/10.13040/IJPSR.0975-8232. IJP.1(8).501-06. Authors Address: School of Chemical Sciences, North Maharashtra University, Jalgaon, Maharashtra, India.